The Exo Terra Elevated Outcrop provides reptiles with an additional elevated basking area and increased 3-D dwelling space. The Elevated Outcrop enables your animals to get closer to the heat and UV emitting bulbs, maximizing UV and thermoregulation. 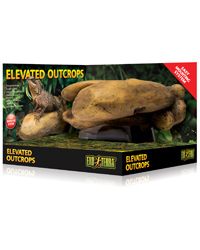 Reptiles and amphibians can use the Elevated Outcrop as a raised lookout as well as a safe sleeping spot, experiencing an increased feeling of safety and reduced overnight stress.